Knowledge of plant names can give insight into largely forgotten beliefs. For example, the common red poppy is known as "Blind Man" due to an old superstitious belief that if the poppy were put to the eyes it would cause blindness. Many plant names derived from superstition, folk lore, or primal beliefs. Other names are purely descriptive and can serve to explain the meaning of the botanical name. For example, Beauty-Berry is the name given to the American shrub that belongs to the genus Callicarpa. Callicarpa is Greek for beautiful fruit. Still other names come from literary sources providing rich detail of the transmission of words through the ages. 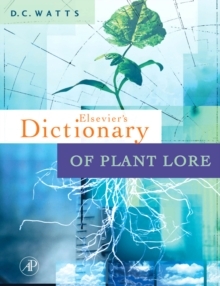 Conceived as part of the author's wider interest in plant and tree lore and ethnobotanical studies, this fully revised edition of Elsevier's Dictionary of Plant Names and Their Origins contains over 30,000 vernacular and literary English names of plants. Wild and cultivated plants alike are identified by the botanical name. Further detail provides a brief account of the meaning of the name and detailed commentary on common usage.